Status Quo play electrified for the final time at the SSE Hydro Glasgow this December. Sad to see the institution call it a day on their electric boogie, but Status Quo are retiring the amps on this final plugged in tour. Hitting the big arenas around the UK, the classic duo of Rick Parfitt and Francis Rossi will be dropping into the Hydro on Tuesday 20th December 2016. 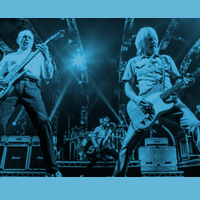 Tickets are selling fast for this landmark show, catch Status Quo for the last time amped up to the max.